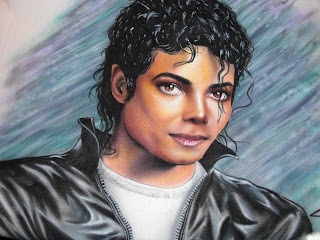 After more than a week off I am back and sharing more fun Michael Jackson memorbilia. I sold these gloves in my store in the 80's. 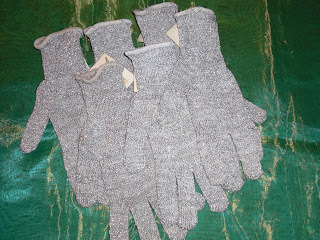 They are stretchy with silver glitter elastic thread running throughout the glove. They were so popular and people would come in and try one on and had to buy it. The glove was like magic!! 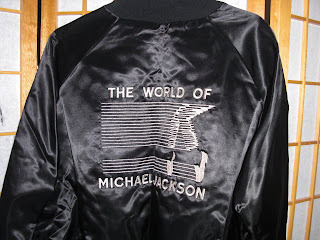 This jacket is from the Michael Jackson fan club. I had the matching t-shirt and sweatshirt which I wore all the time. I didn't wear the jacket because I was afraid I would never be able to replace it if I wore it out. The jacket is black satin with silver thread for the logo! 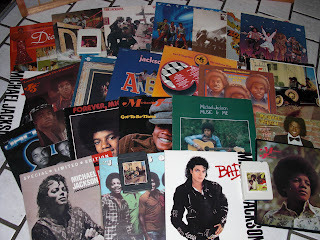 My Michael Jackson and Jackson 5 album collection. There are a couple of 8tracks. I had many cassettes and have all the CD and CD mixes. I actually bought my first CD player because of Michael Jackson. I already had the "BAD" album and I found out there were bonus tracks on the CD. Off I went to buy the CD and a player! I love these shoes!! 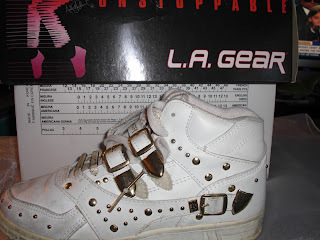 LA Gear came out with a line of Michael Jackson shoes called "Unstoppable"
This is my prized artist designed shirt. It is definitely a piece of artwork and from the Smooth Criminal time period. I have this hanging in my bedroom. 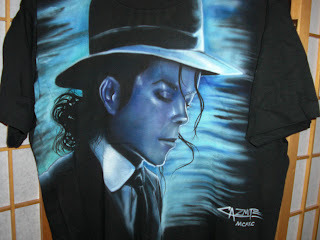 The beautiful blue on the black shirt has the great nighttime effect. Thanks for sharing my love for Michael. Next post will be about some fabulous finds of the week! Hello I am Tina the Trend Guru. I will be updating you on trends and fabulous finds. I have decided that my first posts would be about the the original trend setter, Michael Jackson. Michael has meant so much to me in my life and for millions around the world and has definitely set the trends in music, dance, fashion and art to name a few things. There is no one who defines style like Michael Jackson. He was a true original. Please share with me the beginnings of my love for Michael Jackson. 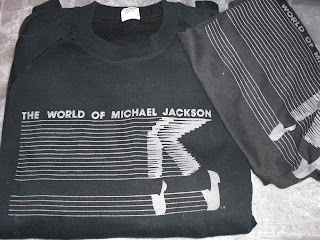 This journey will be told in this first post with some of my Michael Jackson t-shirts! 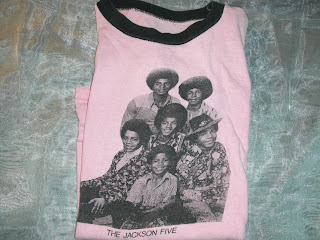 My first shirt is a Jackson 5 shirt. My friend and I wore these shirts with matching hats while we mastered the J-5 moves to their songs! 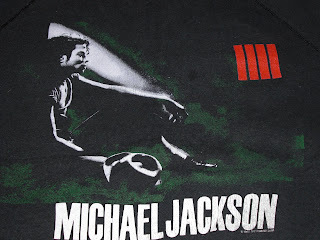 The next shirt is from the Michael Jackson fan club I belonged to in the 80's. I had to get everything they made starting with this t-shirt and sweatshirt. 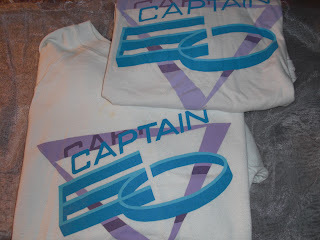 My next set of sweatshirt and t-shirt are from Captain EO, the Disneyland 3-D movie. I went to Disneyland many, many times to see this amazing production with Michael. I loved that he was in 3-D and it seemed he was right in front of me and I was part of his space adventure. This shirts is one of my prized shirts. My friend had it made by an artist we met in Dallas, TX. She sent him one of my favorite photos and he did this piece of artistry in 1990. It arrived just in time for my birthday and I have cherished it ever since! And lastly I will end with this memorial shirt. 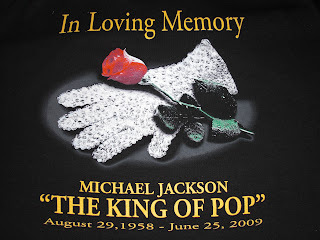 This is the shirt I wore today, the day of the Michael Jackson memorial. I still can't believe he is no longer with us...I will always love Michael Jackson! I have so many fun Michael things to share! More to come!